Welcome to the Coalition for Safe Acupuncture Practice (CSAP). CSAP exists to provide a forum for responding to issues that affect the safe practice of Acupuncture and Oriental Medicine generally and impact Licensed Acupuncturists specifically in the United States. public demonstration. Join us by signing the CSAP petition! 16 to 24 hours of classroom education with no needle technique clinical internship training being included. CSAP exists to promote public awareness of the regulatory and public safety issues surrounding the issue of Dry Needling by Physical Therapists.. Please joint us by signing the Coalition for Safe Acupuncture Practice Petition found below. 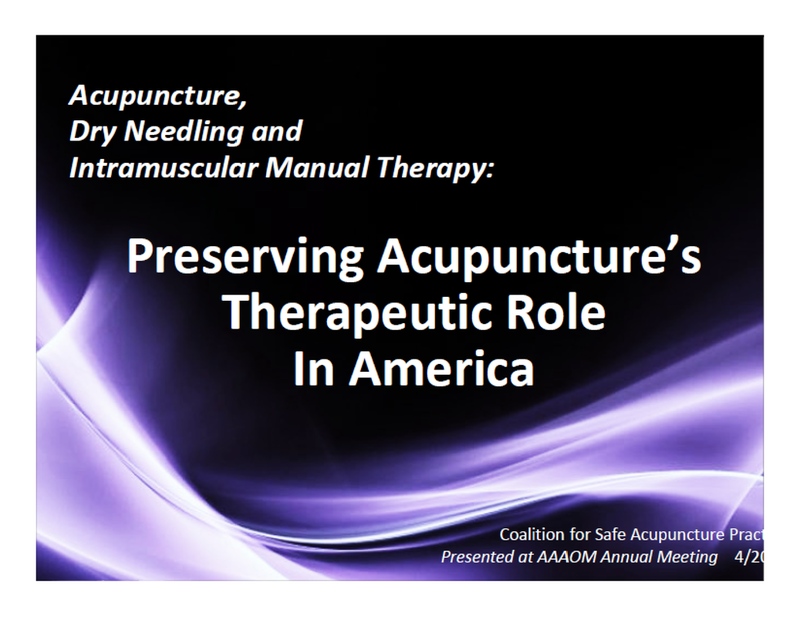 Click above to view power point exploring Dry Needling and Acupuncture practice. 1. Acupuncture is the stimulation of specific anatomical locations on the human body, alone or in combination, to treat disease, pain and dysfunction and to promote wellness. 2. Acupuncture is the invasive or non‐invasive stimulation of said locations by means of insertion of solid, filiform, sterile needles or by other thermal, electrical, light, mechanical or manual therapeutic methods of stimulation. 3. Acupuncture, as a field of practice, is the study of how acupuncture can be applied to health and wellness and the treatment of pain, disease and other dysfunctions of the human body. 4. Dry Needling, Trigger Point Dry Needling, and Intramuscular Manual Therapy are, by definition, Acupuncture. 5. Any intervention that makes use of Dry Needling, regardless of the language employed in describing the procedure, is the practice of Acupuncture. CSAP needs both email and postal address to submit form to lawmakers. Thank you!